Diptychs are two photographs; Triptychs are three that have been placed together to tell a single, intertwining story. While diptychs can be as unique as their creator’s imagination, the most popular ones can tell a simple story. Photography is about visual communication: sharing stories, ideas, and feelings through images. A diptych of two images, or parts of two images, is an impact full storytelling tool. Look for thematic, composition, and other visual synergies that will make your diptychs more powerful than the sum of their parts. Diptych and triptych come from the Greek meaning two (dip) or three (trip) fold (tych). Many modern artists create pieces that are designed to be on display together and the diptych and triptych have become very popular story telling devices. As well as being great story-telling devices, diptychs and triptychs are visually pleasing and help make use of photos that may not work on their own. There is no right or wrong when it comes to these composites so play, have fun and put together whatever feels right. Think complimentary images or think completely opposite images! Try color combinations, pictures with a running theme, things that show movement or photos that show the passage of time. The possibilities are endless! GOAL: You will complete 6 sets of Diptych or Triptych combinations. You can choose to complete 6 diptych or 6 triptych combinations or a mix of both. The shutter speed refers to the length of time the opening in the lens remains open to let light into the camera and onto the sensor. The shutter speed can be as fast as 1/10,000 of a second or as slow as several minutes. Fast shutter speeds have the effect of freezing motion in the scene you are photographing. Conversely, slow shutter speeds will blur motion in a scene. Both of these can be used to great creative effect. The chart below shows how different shutter speeds would effect the sense of motion if you were photographing a person running. Fast shutter speeds will freeze the motion. This technique is often used in sports photography. The slower the shutter speed becomes, the more blurred the person running becomes in the photograph. GOAL: Using the Tv (Shutter Priority Mode) complete 10 photographs. Take 5 using a fast shutter speed and take 5 using a slow shutter speed. Title the assignment Shutter Priority and upload Motion Blur for slow speeds and Frozen Motion for fast speeds. 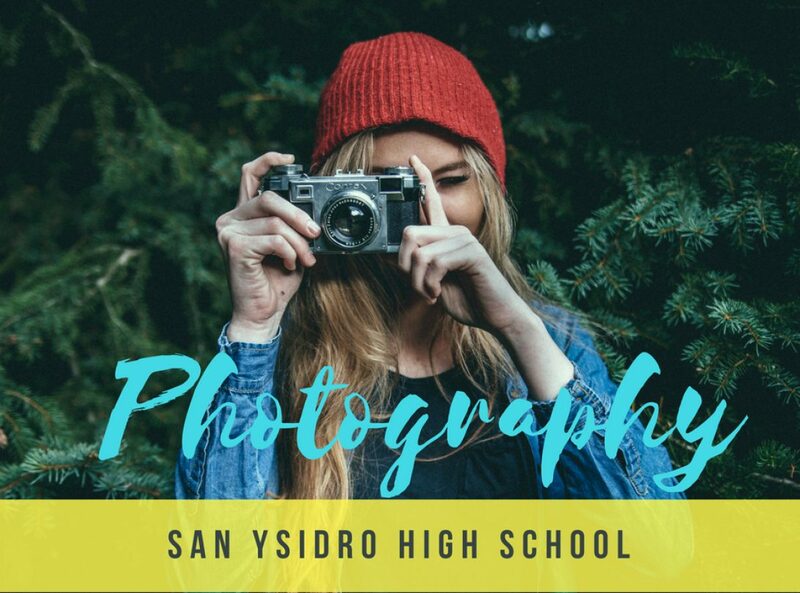 Designed to educate students on how to use industry standard digital editing software, hardware and digital camera equipment. Instruction in design, rules of composition, history of photography, master photographers and careers in photography are covered. The CA Visual Art Standards create the framework for students learning skills related to digital camera uses. Vantage Point and Frame are essential choices that must be made by photographers no matter what their ultimate goal for image making. This act of choosing what to include and exclude, what is our central focus and what is on the periphery (outside the frame), as well as the vantage point and point of view of the camera provides context and meaning. The use of the photographic frame as constructed in the camera’s viewfinder is central to reflecting the intentional visual and conceptual concerns in how photographic meaning is considered. Shooting from a low angle is probably the most popular alternative to eye-level perspective photography. It can be challenging because you may have to squat, sit, kneel or lie down to capture your image. It’s worth the effort because it provides an out-of-the-ordinary look at your subject and the results can be stunning. Start by identifying your subject and find a low angle to shoot from. You might even want to place your camera or iPhone on the ground for additional support. You can use leading lines or anything in the foreground to draw the viewer into your image. Focus on the interesting angles you find when your camera is really close to the ground or better yet, on the ground, level with or looking up at your subject. You could also experiment with flipping your iPhone so the camera lens is closer to the ground. This will provide an even stronger low-angle effect. Looking down towards your subject is another way to get a new and unique angle with your perspective photography. You don’t necessarily need to climb to the top of a building to accomplish this, but that is one popular possibility. In fact, if you can gain access to the upper floors or the roof of a tall building, you can discover some amazing vantage points. There are other ways to get above your subject, whether you’re standing on something that gives you a little lift or if you’re just naturally taller than your subject. It could be as simple as looking down into the cup of coffee you’re holding, with your feet and the ground beneath them included for depth. You could also try this technique with portraits by having your subject lie on the ground or sit and look up at the camera. Just be sure the angle flatters them and enhances their appearance. Go above and beyond your typical habits and present your surroundings from top to bottom. The view you create might serve as an exciting new perspective that you can use again and again, improving your photography in the process.